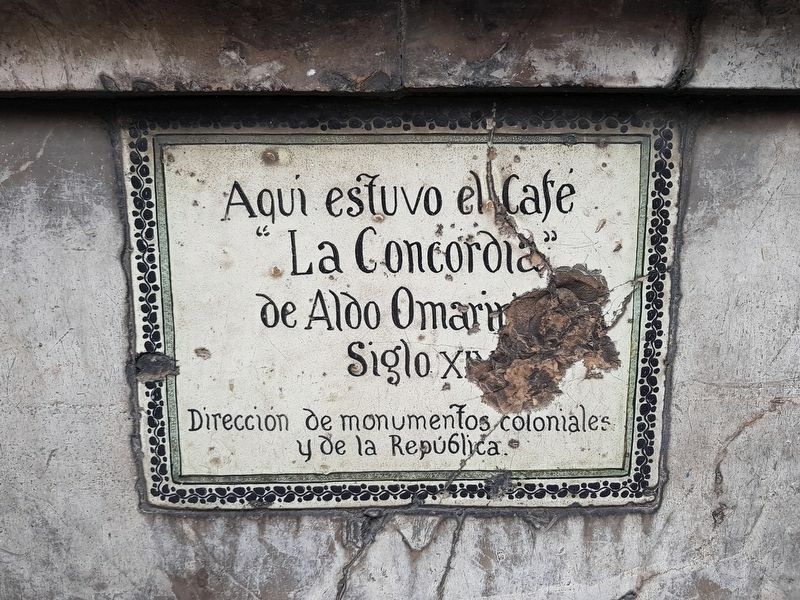 Aquí estuvo el Café “La Concordia” de Aldo Omarini. Here was the La Concordia Café of Aldo Omarini. Location. 19° 26.012′ N, 99° 8.17′ W. Marker is in Ciudad de Mexico, Ciudad de México. Marker is at the intersection of Francisco I. Madero and Calle Isabel la Católica, on the left when traveling east on Francisco I. Madero. Touch for map. Marker is in this post office area: Ciudad de Mexico, Ciudad de México 06000, Mexico. Touch for directions. The marker is low and to the right of the entrance to the building shown here, now a branch of the Zara clothing store. distance of this marker); Hotel Gillow (within shouting distance of this marker); House of the Condes de Miravalle (within shouting distance of this marker); Hospital del Espíritu Santo (within shouting distance of this marker); Calle de las Carreras (about 90 meters away, measured in a direct line). Touch for a list and map of all markers in Ciudad de Mexico. Regarding Café La Concordia. 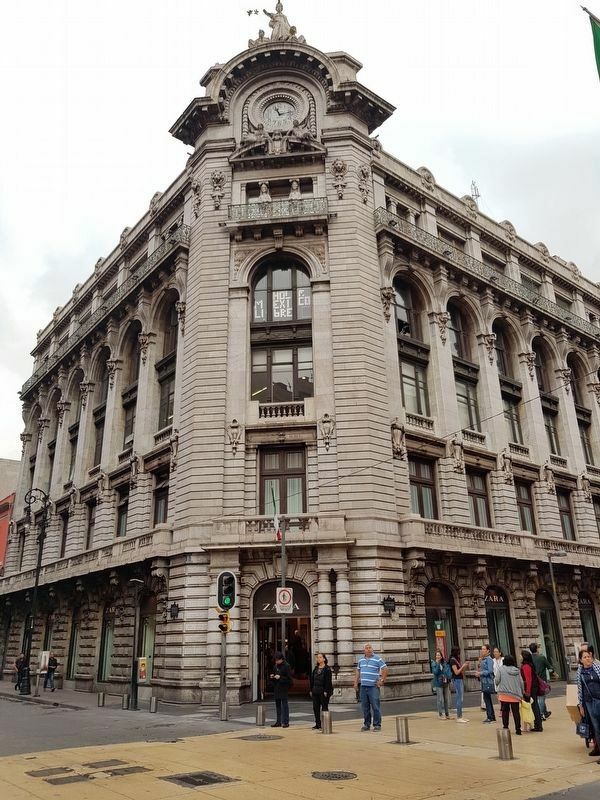 The Café de La Concordia opened sometime before 1868 and soon became famous as the leading figures of Mexican literature, art, military, business, religion and politics of that time visited. That year, Aldo Omarini, its owner, improved the premises to reopen it as an inn. The historian and researcher Clementina Díaz y de Ovando (1916-2012) mentions in one of her texts that "the Café de La Concordia, according to the press, was on par with the best in Europe in amenities, decorations and service." It occupied the northeastern corner of Plateros (Madero) and San José el Real (Isabel la Católica) streets, in a three-story mansion. Demolished in 1908, the La Mexicana Insurance Company would build its five-story headquarters on the site. More. Search the internet for Café La Concordia. Credits. This page was last revised on October 17, 2018. This page originally submitted on October 17, 2018, by J. Makali Bruton of Querétaro, Mexico. This page has been viewed 34 times since then and 3 times this year. Photos: 1, 2. submitted on October 17, 2018, by J. Makali Bruton of Querétaro, Mexico.